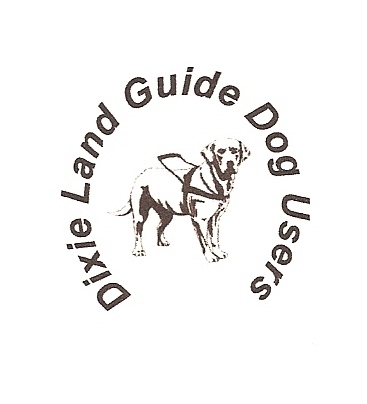 Dixie Land Guide Dog Users: Dixie Land Talks About Jesus at Camp Lakewood! 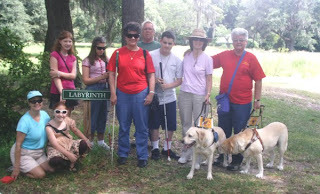 Dixie Landers meet Camp Lakewood Day-Campers at the entrance to the Mepkin Abbey Labyrinth! Dixie Land Guide Dog Users was proud to sponsor and participate in Day three of Camp Lakewood, a field trip day, dedicated to Jesus' birth, earthly ministry and death for our sins. We traveled about fifty miles to the Mepkin Abbey, an area monastery. On the way, we did our Worship singing and discussed the first coming of Jesus into the world. Then, we lightened things up with a game of "Animal, Vegetable, Mineral", which neither of the children had ever played before. Even Great-Grandpa Jerry, who drove, got into the fun of the game! The monastery features a unique labyrinth (maze) made with very tall grasses. The kids got in some practice with their skills traveling with the long, white cane walking thru the maze! It was wonderful to see the kids' confidence increase as they found their own way. Thirteen-year-old S even used her ears to help her travel. The tall grasses bordering the path thru the maze were full of little crickets. "The crickets are like arrows," she exclaimed excitedly. "They point the way for us!" After our exercise in the labyrinth, we headed for the gardens, where two sculptures awaited us. During HURRICANE Hugo, many trees fell, including two large oaks on the grounds of the monastery. A man looked at the fallen trees and saw a vision of two Biblical depictions, the escape into Egypt and the Crucifixion of our Lord. He brought his chain saw and created two of the most detailed depictions of these scenes we have ever experienced. We arrived at the first sculpture. S was asked to read to us from her Braille youth Bible the account of Mary, Joseph and Baby Jesus as they escaped from Herod. Then each child was able to feel the life-sized statue depicting this event. Then, S read again from her Bible the account of the Crucifixion of our Lord. Just as she read that Jesus proclaimed, "It is finished," the chimes at the monastery chapel began to sound. Only God could have orchestrated such timing. Each of the children felt the crown of thorns on Jesus' head, His face, His beard, the cross and the nails driven into His hands and feet. Then they joined Laurel Jean in singing a chorus of "This Is The Day" and "Alleluia". We stopped for lunch in Summerville, where the children were allowed to interact independently with our waiter and waitress. We even sang our table prayer in the restaurant! A big thanks to Jerry, Audrey, Zack, Nancy, Luna, Max, Marti and Jackie for all of their help in making this day a success.